Dr. Stixrud will begin the presentation by briefly summarizing what is known about the effects of technology on kids' development. Dr. Pletter will then discuss his five keys to setting up a family technology contract and introduce his new iParent 101 program. Finally, Dr. Reiter will talk about ways to help kids whose use of the internet, social media, or video games is harming their development. Following the presentations there will be a question and answer period with the three presenters. 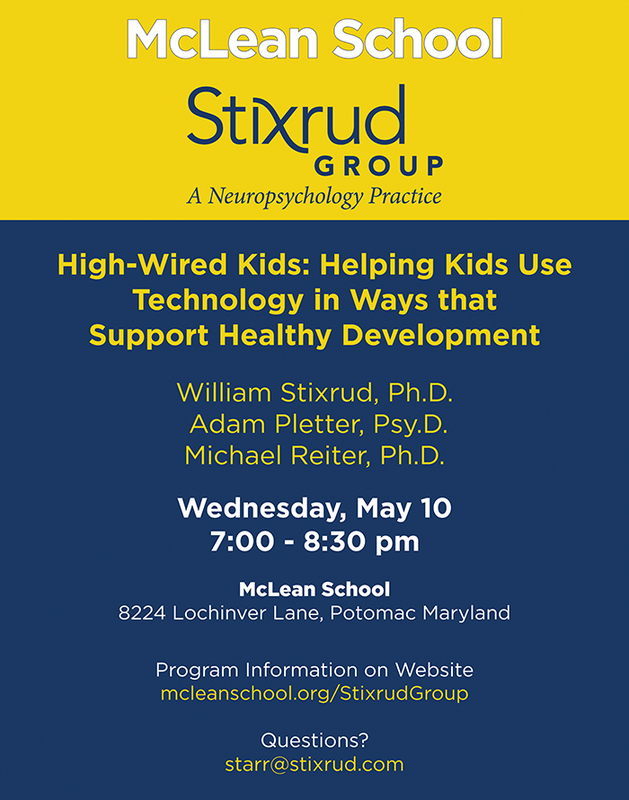 William R. Stixrud, Ph.D., is a clinical neuropsychologist and director of the Stixrud Group. He is also a member of the Adjunct Faculty of the Children’s National Medical Center, and he holds an appointment as Assistant Professor of Psychiatry, Behavioral Sciences, and Pediatrics at the George Washington University School of Medicine. He is the author, along with Ned Johnson, of the upcoming book, Wired for Control: The Science and Sense of Allowing Kids to Find Themselves (Viking Books, September 2017). Dr. Stixrud is also a musician and plays in the band, Larry 2.0. Adam Pletter, Psy.D., is a licensed clinical psychologist in Maryland in his 16th year of private practice and has been a Digital Dad for 13 years. He received his Doctor of Psychology degree from the George Washington University and specializes in the treatment of children, adolescents, and young adults. Dr. Pletter developed and runs iParent 101, a digital parenting workshop and E-Course and has written on the topic for the Washington Post and other media outlets. More information about can be found at www.iparent101.com. Michael Reiter, Ph.D., is a psychologist in Rockville, Maryland. He earned his MPhil & PhD from The George Washington University and works with children, adolescents, & young adults in the treatment anxiety disorders, ADHD/executive functioning deficits, and technology overuse. He also specializes in helping emerging adults (and their families) who are stuck and/or struggling to move forward. The physical and hormonal changes that begin at puberty are accompanied by rapid developments in the brain, which continue throughout adolescence. These physiological developments dramatically change the emotional landscape for teens, as they increase young people’s capacity for pleasure, especially in the presence of peers, but also make them more easily stressed, thereby increasing their vulnerability to anxiety, depression, and other mental health problems. 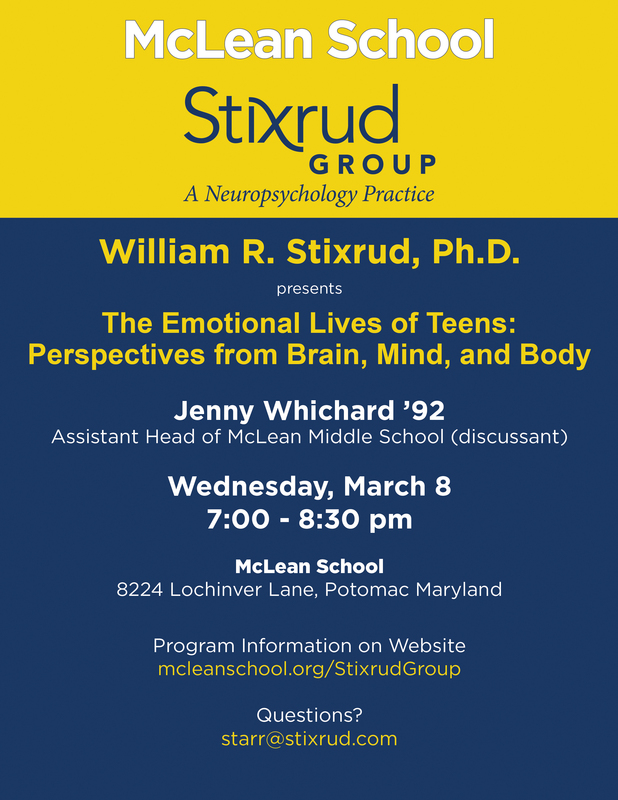 In this talk, Dr. Stixrud will summarize research on the emotional lives of adolescents. He will discuss how factors such as gender, social media, academic competition, and insufficient sleep are affecting their inner life, and he will present suggestions to parents and educators for promoting healthy emotional development in teenagers. Many students go off to college after graduating from high school who have shown no signs of being able to independently run their own lives. Thousands of these kids flunk out of college or are placed on academic probation in their first year, at great emotional cost to the kids and enormous financial cost to the kids and/or their families. In this lecture, Dr. William Stixrud and Ms. Judith Bass will discuss contemporary life on college campuses and why so many students cannot handle college successfully, at least right out of high school. They will argue that four years of college should not be considered as an “entitlement” for kids - but rather as an extremely important investment that should be made wisely and at the right time. The rest of the lecture will focus on (1) how to determine when a student is ready to begin college, (2) how to talk with children, starting in the ninth grade, about the kinds of skills, attitudes, and behaviors they will need to show in order to demonstrate their college readiness, (3) how having a learning disability and/or ADHD affects college readiness, (4) how to help kids get ready to be successful in college, and (5) what do to with kids who aren’t yet ready to go. Ms. Serota will add the perspective of a college counselor working in an independent school.